Like all batteries, your backup has a useful life of about 3 to 5 years, but that life may be shortened if you have had several power outages. Your system battery should be checked annually, or after any storm related false alarm, by an alarm technician and replaced when needed. Power failures, as well as surges, occur on a fairly frequent basis. They should not, however, be the cause of a false alarm. If the power goes out for any reason, the alarm system’s battery backup should kick in and avoid a false alarm. Most backup batteries last for a minimum of four hours and some jurisdictions even have a time frame built into their ordinance mandating how long the backup battery must last. Almost all security systems have a rechargeable battery that powers the system for a minimum of four hours in the event of a power outage. If you have a wireless system, you may have several batteries in the motion detectors, as well as a backup system battery. Change all control panel batteries at least every 3 years or more often if you experience frequent power outages. 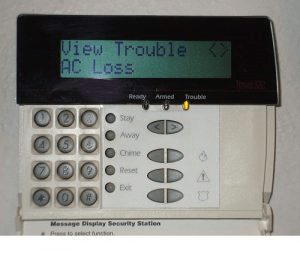 All security alarms have a large back-up battery in the control panel that runs the system for four to six hours during power outages. The life of a battery depends on how many power consuming devices are installed and how often the batteries are required to “kick-in” due to power failures. Be proactive and replace batteries before they die and cause false alarms. Always replace per manufacturer or alarm company specifications.